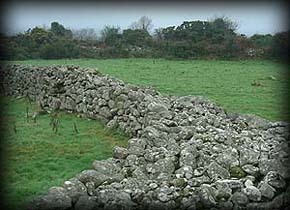 Rathgall is one of the biggest and most impressive stone built hill forts I have seen, consisting of four rings the three inner rings have concentric stone built walls and these are surrounded by an outer ditch. The Eastern side of the inner walls must be at least 4 metres wide, pictured left. The inner walls were added at a later date probably around the early christian era. 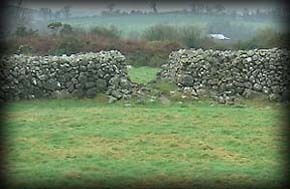 The inner walls are also pictured bottom, the picture below shows the inner wall with one of the outer walls just visible surrounding it. Rathgall has been tentatively identified as the seat of the Kings of Leinster. Situated: In West Wicklow about 4 1/2 miles west of Tullow. From Tullow take the R275 to Shillelagh after 2 kilometres take the left fork in the road the hill fort is well sign posted about 2 kilometres down this road on the right hand side.